@RolandWolf Hi! I&apos;m watching the DVD. Would you please add a speed option so I can listen on double speed? Thanks! Can I still get a copy of your dvd at the discounted price? @RolandWolf I was looking through your trades and I think I&apos;ve been managing my risk wrong. I noticed how fairly often you lose up to like 15%. Obviously not as often as your profits, which are even bigger in percentages. But it&apos;s interesting to me how profitable you are with some of those big percentage losses. Gonna give that type of risk management a try. Setting better risk gives the stock more room to come back. I always notice that when I get out it&apos;ll just rip when I get out because I get stopped out too easily. @AppleTree1415 I guess I didn't think of it that way. I was thinking more along the lines of "if it hits a certain support level, I'm out because if it crack it could really tank" or something if that made sense? I get what you mean by saying you don't want to lose a certain dollar amount. I just have to mess around with it a little. Alright I'll watch it! Thanks man! Good response AppleTree1415. Great question Chance! @RolandWolf I have been trying find a good dip entry point on charts such as $ECYT and $ARWR for a swing long trade. Not able to figure out where to enter such types of good Long Term Daily Charts. Can you please provide some insights on these? How would you have analyzed these 2 stocks? @RolandWolf I saw one of your interview video and it&apos;s like reading a book. It can be 500 pages long, but you really soak up about a sentence worth that you keep forever. In that interview, you didn&apos;t take profits early because you were looking at the "big picture" of what it was doing. There you took further gains and that has helped me alot when I trade today. By trading the big picture setup and not worry too much about the small noise in between, but not to also be complacent about the little noise that goes on. 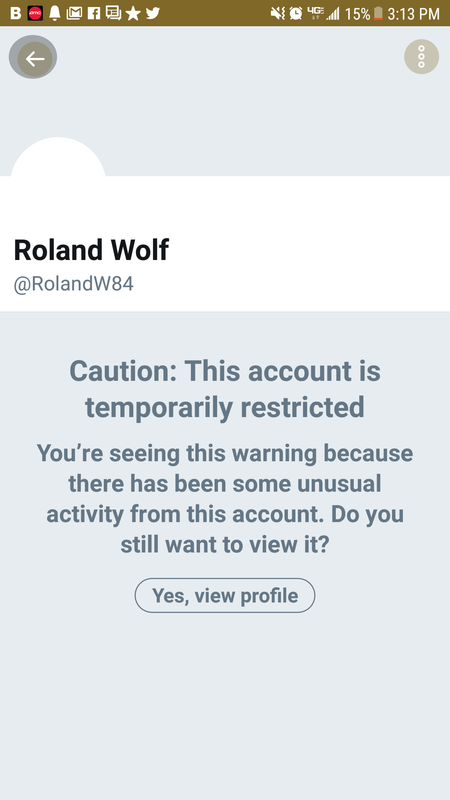 @RolandWolf just wanted to let you know Twitter set up a temporary account restriction. Just want to confirm this actually is you by an alternate route in case your account was compromised. @DevDevy Thanks. Thought something was off when none if the links worked and everything was retweeted from @RolandWolf86. I was DM by this account. Clincher was when they asked if I wanted in in a business deal. Sorry. I'm new to all of this. @RolandWolf Saw you interview on here recently and really happy for you and your family. 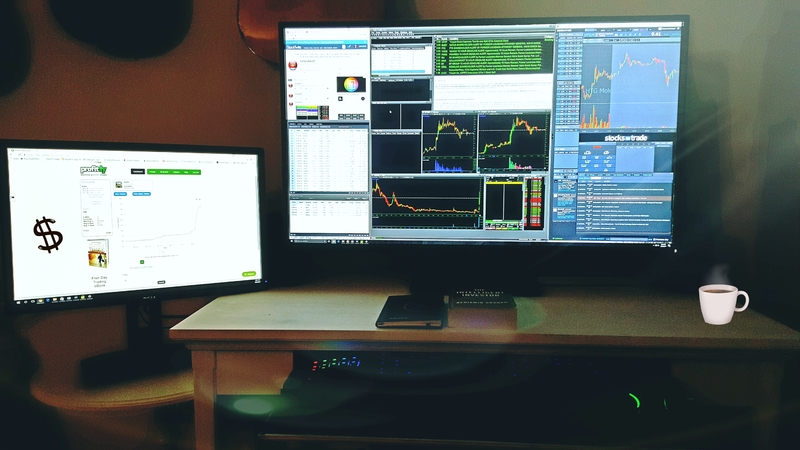 I need to learn more, a lot more, before feeling comfortable enough to confidently trade. I have been watching the 14 videos Tim offers for FREE to all. 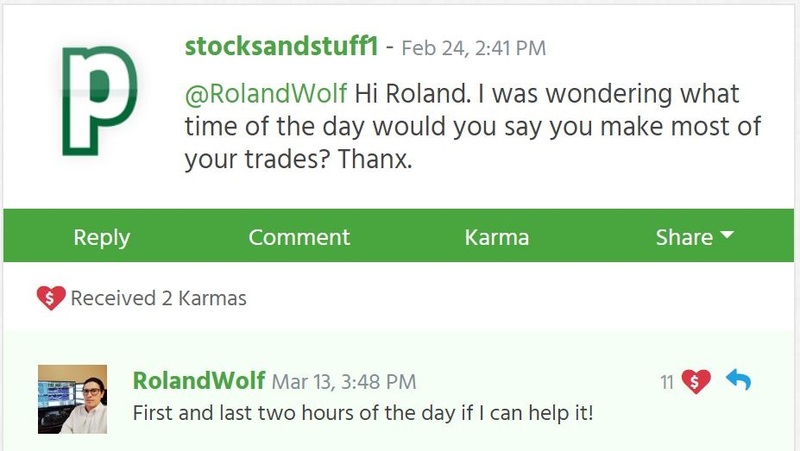 Trading for the 1st 2 hours a day is tough right now for me. I heard loud and clear your hours were flexible at 1st in the family biz. How crazy would it be to do NOTHING but learn and educate myself the next 6 to 8 months, sell my house, take the proceeds and rent a place and trade with the remainder? Maybe I paper trade a few months too before doing this. I have a son and want to plan smart and not fast. I am willing to take the time to get there. Any key tips, videos, advice or words of wisdom to offer? Keep at man. I am impressed and happy for you. @joecrowley7777 You don't need to sell your house to do the stock market.. I think selling your house in a very bad idea. Check Tim Grittani story. Agree 100% and thanks for the gut check. I really count myself as fiscally conservative and will take the advice wholeheartedly. 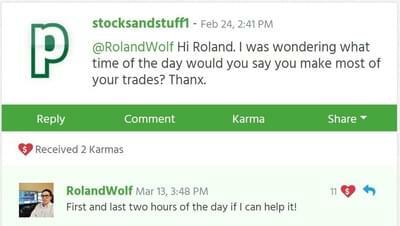 @RolandWolf Hey Roland I just starting to trade and I would like to know what dvds or lessons did you study when you start trading, please please let me know I will really appreciate this information. Thanks!